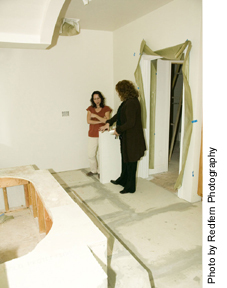 transplant to Nevada County (Fall '04), I previously provided interior design services for residents of Sonoma County (and occasionally Napa, and Marin) for over 20 years and originally hail from the Los Angeles area where I acquired my design education. My initial work in the field entailed 5 years full-time as a designer for a family-owned decorating shop located in historic Petaluma specializing in custom window treatments, followed by employment as a staff designer with a specialty custom furnishings store with 3 locations in the Northbay. After all those years working for "the store," I was convinced consumers didn't need another decorator giving them a "sales pitch"...instead, I knew they were eager for fresh and innovative design ideas, practical purchasing advice (including the oh-so-important technical information -- I've found most consumers simply don't know which questions should even be asked prior to purchasing), along with some appropriate respect for their budget, and personal sense of style. Determined to provide just that, Renaissance Design Consultations was born in the Fall of 1992. In that same year, I qualified for professional membership in the trade organization, the International Furnishing & Design Association (IFDA), which is predicated upon education as well as professional experience combined with recommendations by other trade professionals. I've also been cited as a design expert by journalists for an array of articles appearing on FoxNews.com(three times), AOL (multiple instances), BobVila.com, a nationally-syndicated column in the Chicago Tribune several times, and the National Home Furnishings Assoc. -- and, most recently, for articles on Realtor.com as well as Bed, Bath & Beyon'ds blog. While I can assist with virtually any aspect of interior (or exterior) design and am equally skilled with contemporary as well as traditional interiors, my forte is color, imaginative pattern mixing for a customized look, and working with historic homes as well as European country themes including antiques. Some designers utilize what's called a "signature style," i.e. you can take one look at any completed room of theirs and say, "Oh, I see you had so-'n-so create your space." To me, this one-size-fits all approach seems like they only have one flavor of design to offer their clients -- theirs! LEARN more about my unique policy of "giving away" my to-the-trade discounts to my clients. 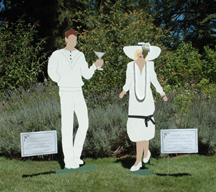 Asked to style the local community hospital foundation's 20th anniversary gala (their primary annual fundraiser) -- Starry, Starry Night, an all-white Gatsby themed dinner/dance which is one of the highest profile social gatherings held annually in Grass Valley. Click here to see 2 pages of photos including the life-sized collection of vintage-attired silhouettes I designed and fabricated for the event. Home Advisor (formerly Service Magic). Recently "promoted" by HomeAdvisor from Top-Rated to this Elite Service designation based on my client ratings. Read reviews of my work via these services by clicking on the links above (NOTE: will open in new browser window) plus see what other clients of mine have said.